Where are all the mammals? One question I am frequently asked is where are all the mammal photos? 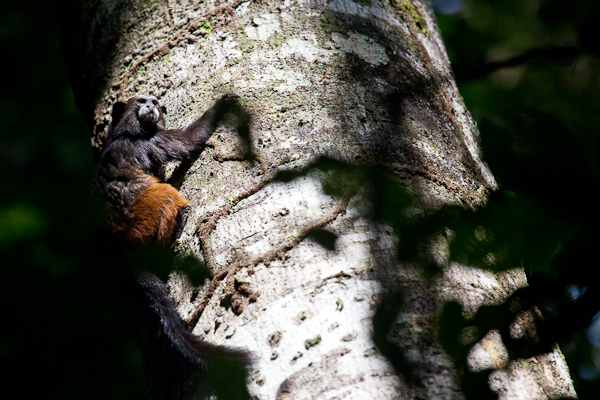 When people picture a rainforest, they see a canopy teeming with monkeys and jaguars weaving between the trees. Let me assure you that this fantasy is quickly shattered when you first visit a primary forest. I spend an average of six hours in the field per day and cover anywhere from two to ten kilometers in that time. During 12 days of work here at the station I have seen huanganas (wild pigs), lobos del rio (giant river otters), capybara, six species of monkeys, and a squirrel. I consider these sightings to be incredibly lucky. Of those sightings, I was able to take decent photographs of three species. Why is it so difficult? First of all, there just aren’t that many mammals in terms of species richness and species abundance. 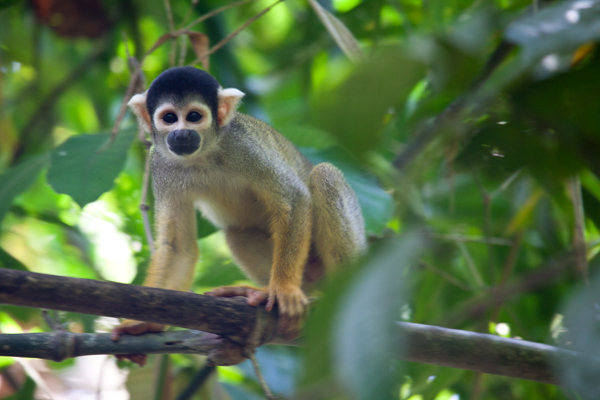 For instance, in a forest with over 1000 species of butterflies, there are only 9 species of monkeys. Second, mammals experience a lot of hunting pressure – their numbers are reduced over time by the bushmeat trade and by the wild pet trade. While the forest here is relatively unimpacted, local people do eat tapir, capybara, and other mammals. The giant river otter is just one of the species that has been driven close to extinction because of hunting (for its pelt) and habitat loss. Listed as endangered by the IUCN in 1999, it is estimated that there are less than 5000 left in the wild. People also kill jaguar and puma for the same reason that farmers kill wolves in the United States – fear for their livestock and livelihoods. Mammals are skittish and I’m pretty sure I sound like a freight train when I walk through the forest. Despite the care I take to walk slowly and carefully, the leaves crunch under my feet and branches snap in the leaf litter. Any mammals that were nearby quickly disappear in the thick undergrowth. I’m positive that I pass by mammals all the time, but seeing them in the tangle of lianas and bushes is virtually impossible. One of my friends and mentors worked in Brazil for over 15 years before he saw his first jaguar in the wild. Thus, you can almost equate seeing a jaguar in good light and for long enough to take a picture with winning the lottery. Monkeys are relatively common and I do see them at least once a day. However, seeing monkeys and photographing monkeys are entirely different things. I went out with a monkey researcher the other day in hopes of photographing a group that he is studying. We found them, but they were at the top of a tree in dappled light. And the top of a tree here is not like the top of an oak back home. The top of a tree here is so far away that the monkeys look like specks with my 400mm lens. And, to top it all off, I am constantly battling with the light. Yesterday it was cloudy out and in the forest my shutter speed at ISO 800 with an aperture of 5.6 was four seconds. Trying to capture a sharp image of a wild pig foraging in that light is impossible. I spend most of my time whispering “tranquilo, tranquilo” to insects (yes, I talk to my subjects) with the insane hope that they will settle down so I can make a 15 second exposure at f/32. I hope this does not sound like a tirade or rant; I just want to explain the challenges of this type of photography. Every day only increases my respect for the photographers who specialize in large mammals and have achieved incredible images of these majestic species in the wild. I’m hoping that by going out everyday for the next seven months, I might just beat the odds and win the lottery. ← A few favorites . . .